Are you tired if breaking screw drivers and buggering up the slot and face of your magazine tube screw? Tired of not having the right tool to remove the magazine tube screw to clear a jam? And, the all important regular Mag tube cleaning? Need to remove the firing pin Bushings on your Side-by-Side? Need extra leverage to remove some over-tightened screws?? Looking for a tool that serves that purpose and is handy and available in your gun cart? The standard SliX-slot has two exacting tips to fit most magazine tube screws. 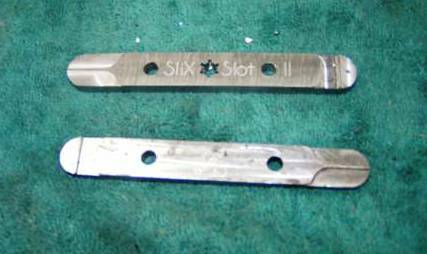 The SliX-Slot II has the same tips, PLUS the three pin spanner for removing firing pin bushings, and includes a “Hex-Head” recess to accept all standard ¼” screwdriver tips.